“Courage Through Faith” from Christian Faith Publishing author Shiloh Yazdani is one soldier’s personal spiritual journey through the worst conflict the world has ever seen. 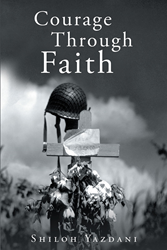 “Courage Through Faith”: a story of faith during World War II where a young soldier learns the true value of belief. “Courage Through Faith” is the creation of 21-year-old published author, Shiloh Yazdani, who was raised in a Christian family in rural Ohio and has always had an interest in history. Published by Christian Faith Publishing, Shiloh Yazdani’s new book thrusts readers into the chaos of World War II, where a young soldier discovers the values of courage and faith. Through the horrors that Chris Bryson experiences, he realizes that courage allows men to face bullets, whereas faith allows them to face death. While the war exposes Bryson to some of the worst humanity has to offer, there are also those trying to do good in a world of chaos that influence the soldier’s development. View a synopsis of “Courage Through Faith” on YouTube. Consumers can purchase “Courage Through Faith” at traditional brick & mortar bookstores, or online at Amazon.com, Apple iTunes store, Kobo or Barnes and Noble. For additional information or inquiries about “Courage Through Faith”, contact the Christian Faith Publishing media department at 866-554-0919.